His Eminence, Sheikh Ahmad Muhammad Amin Kuftaro, the Grand Mufti of Syria, Head of the Supreme Council of Fatwa, was born in Damascus in 1915, son of Muhammad Amin Kuftaro (1875-1938), a great Muslim scholar of his day. Sheikh Ahmad Kuftaro studied privately with the most renowned Jurists and scholars in Damascus, and holds several honorary doctorates in the principles and teaching of Islam, granted to His Eminence by universities throughout the Islamic world. Since 1938, at the death of his father, he has been, teaching in AbuNour mosque, preaching and calling for the pursuit of the universal knowledge, freedom of religion, moral rearmament among the Muslims of the world, interfaith cooperation, and, more recently, for protection of the global environment and for American moral leadership in the world. In 1946, at the age of 31, he was a founding member of the League of Muslim Scholars, and in 1951 was appointed Mufti of Damascus. In 1958, he was appointed First Mufti of Damascus and a member of the Supreme Council of Fatwa. In 1964, he was elected Grand mufti of Syria and Head of the Supreme Council of Fatwa as well as of the Supreme Council of Waqf (religious endowments). In 1968 he was awarded the Sitaret Pakistan Medal. Medal of justice by the Padistany president Ayoub Khann. In 1968, he was awarded his first honorary Ph.D. in the Science of Islamic Da'wa by the Indonesian University of Jakarta. 1. Knowledge of the world gained through the scientific method, known as 'ain al yaqin', which was a pillar of the classic Islamic civilization of a millennium ago and the principal contribution of Islam to European civilization. 3. Indirect knowledge gained through the use of the human intellect, largely in the form of the maqasid or universal principles of shari'ah thought, in processing the first two direct sources of knowledge. This third source of knowledge, known as 'ilm al yaqin' in turn, is critically important for increasing our knowledge of the universe gained through scientific observation, as well as our understanding of true knowledge at the highest level, which is ultimate meaning and purpose, granted by Allah through the "eye of the heart". After leaving this world, every person's knowledge will proceed from intellectual understanding, 'ilm al yaqin', to direct spiritual vision, 'ain al yaqin', of reality and truth, as promised in Surah al Takathur of the Quran. In the world, the product of all three of these kinds of knowledge is akhlaq or the development of virtuous character, which should be the core of all education. The mission of Sheikh Ahmad Kuftaro in pursuing this primary goal is reflected in his life-long organizational activism in the field of education. 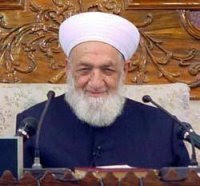 In 1971, he established the Abu Nour Islamic Foundation, which opened the four-year Kulliya Da'wa al Islamiya (Islamic Call College) in 1982, with branches of Lebanon Al-Ouzai College of Islamic Studies, and Pakistan Islamic Studies University, both started in 1989, as well as a branch, granting the M.A. degree, in 1992 at the Um-Durman College of Sudan. In 1992, the Foundation also started the four-year Kulliya Usul Al-Din College in Damascus, which now has more than one hundred students studying for the M.A. degree and the first ones now studying for a Ph.D. in Islamic law. In 1994 Sheikh Ahmad Kuftaro opened the An Nour Institute for Islamic Studies and Arabic Languages in Baltimore, Maryland. Sheikh Ahmad Kuftaro has received honorary doctorates for both his academic and organizational work over the years, the most recent one in Islamic jurisprudence from the Islamic University of Um-Durman during a visit in July 1994. For more than a quarter century of Sheikh Ahmad Kuftaro's life was filled with his battle for freedom of religion under Communism before its demise. In 1969, he met in Moscow with the chairman of the ministerial Department of Religion and arranged to have many mosques opened in Central Asia and helped finance the opening of the Supreme Islamic Institute in Tashkent. He lectured often in the Soviet Union at such events as the "Islamic Conference" at Pako in October, 1986. In 1989, he lectured widely in the Soviet Union as part of the spiritual renaissance that led a year later to its demise. One top official, after meeting with His Eminence Sheikh Ahmad Kuftaro, declared to him, "I am now a believer." Since the end of Communism, Sheikh Ahmad Kuftaro has continued to be very active in reviving Islam throughout the Former Soviet Union. In 1992, he started the first ten-week Imam's Summer School to train imams from the Caucasus and Central Asia at his Abu Nour Kulliya Da'wa al Islamiya in Damascus. In 1995, this "crash course" had 150 participants. In 1993, he expanded his efforts in the former Yugoslavia by heading the Syrian Islamic Delegation to the "Muslim Conference for Bosnia" held in Istanbul, Turkey. In 1994, Sheikh Ahmad headed a Meeting of Muslim University Professors in Delhi and met India's President, Foreign Minister, and Speaker of the Parliament to express his support for religious freedom in Kashmir. His concerns for freedom of religion in Muslim countries led His Eminence Sheikh Ahmad Kuftaro to speak out at an International Religious Conference in Khartoum, the Sudan, in November 1991, where he met the leaders of many religious faiths and delivered the address "Meeting for Peace." The support of human rights is central in all true Islamic thought. This has helped to motivate Sheikh Ahmad Kuftaro throughout his life to call Muslims in every way possible to the pure Islam of the Prophetic period. In 1957, he lectured at Al Azhar University at the invitation of the Egyptian government. In 1962, he attended the 5th Session of the Islamic World Conference (ICO) in Baghdad, and in 1970 led a delegation to its plenary meeting in Jakarta, Indonesia. In 1965, he was elected to the Central Council of the Afro-Asian Islamic Organization in Bandung, Indonesia, and in 1967 represented Syria at its plenary in Jakarta, Indonesia. In 1972-74, he lectured at various Islamic conferences in Algeria, Iran, and India, and in 1976 represented Syria in Saudi Arabia at the First Conference for the Message of the Mosque. In 1995, he visited King Fahd of Saudi Arabia while making Umrah (the Lesser Pilgrimage) to organize support for the enlightened education of Muslims throughout the world. The major commitment of Sheikh Ahmad Kuftaro throughout his life has been to interfaith understanding and cooperation in pursuit of peace, even at times when this commitment was not widely understood or appreciated. In 1954, he was a member of the Syrian delegation to a Muslim-Christian conference held in Lebanon. Sheikh Ahmad Kuftaro has lectured widely on interfaith cooperation as the framework and engine of peace throughout the world, including a speech at Al Aqsa Mosque on the Temple Mount in Jerusalem in 1966 and a number of lectures at the University of Vienna and other places at the invitation of Cardinal Koening of Austria in 1979. One of these talks, "Islam and Christianity: Two Faiths, One God." where he pursued interfaith cooperation in both East and West. On April 17, 1980, by invitation of the Vice President of East Germany, he met with a delegation from the Theology Department of the University of Berlin and produced with them an official Protestant statement that God is One and that Jesus and Muhammad (peace be on them) were both Messengers of God. In 1981, he addressed the Academy of Sciences in Moscow on "Islam and Peace". and at the Inter-Religious Conference in May 1982, in Moscow, he delivered an address on "The Principles of Peace in the World's Religions." designed to increase the awareness among professional clergy of their unique responsibilities to help prevent the development of events that can bring on nuclear war. In 1983 and 1986, he represented the Association of Syrian Scholars at a similar conference in Prague, Czechoslovakia, and in 1984, again in Moscow. In particular, he has worked with officials of the Roman Catholic Church to develop rapprochement in the pursuit of justice and peace. In December, 1985, he lectured at a number of its universities throughout Italy, including a lecture in Milan on "Islam and Religious Tolerance", and visited His Holiness Pope John Paul II prior to giving an address at the Vatican on "The International Prospects of Islam and Christianity". He also gave an address in Khartoum, on religious cooperation as the only effective strategy to assure that minorities have equal rights with the majority and that freedom of religion includes the right and duty of Christians to serve in high governmental posts in a majority-Muslim government, based entirely on a single standard of competence. He visited the Sudan again on similar matters in 1994 and 1995. In March, 1993, he was named Chairman of the Religious Delegation of the Arab League to the "Peace for Humanity Conference" in Vienna, Austria, where he gave a lecture entitled "Brothers Under the Banner of Faith, The Banner of Jesus and Muhammad." The long-standing concern of His Eminence Sheikh Ahmad Kuftaro to protect the physical environment of the earth caused him to be appointed Co-Chairman for the Religious Position at the "Global Forum on Environment and Development for Human Survival, held in 1988 at Oxford University, U.K. Although he unfortunately was unable to attend this meeting, he was elected Chairman for the Religious Discussion at this organization's subsequent conference in January, 1990, in Moscow, where he gave a speech, in the Kremlin, entitled "The Responsibility of Man Towards Himself" at its 1993 meeting in April, held in Kyoto, Japan, he was elected Chairman of the Religious Caucus and delivered a speech, "The Eternal Values" during the "Second Global Forum on Changing Values for Human Survival." In 1990, he began close cooperation with spiritual leaders in the Far East, visiting Tokyo to attend a meeting that led in 1993 to the establishment of the Global Forum Conference in Kyoto. In August, 1991, he gave a speech, to the Oomoto people in Kameoka, Japan; was Guest of Honor at an inter-religious conference in Seoul, Korea, a week later; and on his way home addressed several gatherings of thousands of Muslims in China. In 1992, he was invited by the United Nations to lead the religious session at the Earth Summit in Rio de Janeiro in Brazil and address world leaders with his essay, entitled "The Abrahamic Religions: Common Roots and Shared Responsibilities." He was unable to attend personally due to a back operation. In November of 1993, in Ayabe, Japan. he gave some specific proposals for action, together with an introductory talk, entitled "Faith and the Unity of the Human Family". The first visit of Sheikh Ahmad Kuftaro to America was in 1966, when, at the invitation of the North Lake College Association, from April through June, he gave more than forty-four lectures in Indiana, Ohio and Michigan, educating students and church members about Islam and justice in Palestine. In recent years, Sheikh Ahmad Kuftaro has come to believe strongly that America can recover its religious heritage and share the Islamic heritage in order to renew global civilization in the Twenty-First Century. Sheikh Ahmad Kuftaro with Dr. Robert Schuler head of the crystal church in the United States, During Dr. Schuler's visit to Damascus. He acted on this belief in June, 1989, by a two-week visit, sponsored by the U.S. State Department, to lecture and visit many religious centers and leaders in Washington D.C., Massachusetts, Connecticut, New York, Florida, and Texas. In August, 1990, he attended "The Assembly of the World's Religions" in San Francisco, where he gave several lectures, entitled, "Spirituality in the 21st Century" and "The Quran Extends its Helpful Hand to All Mankind." In December, 1992, he was invited to a religious conference to be held in Greece, to give a lecture entitled "The Conscience in Islam"; however, the Mufti was unable to attend due to poor health and the speech was sent to New York the home of the invitation and delivered in absentia. In 1993, Sheikh Ahmad Kuftaro's Abu Nour Center opened a branch in Baltimore, Maryland, the An Nour Institute, and sent it a short message. The chronological evolution of Sheikh Ahmad's priorities throughout his life shows that he first focused inwardly on rebuilding Islam through education, freedom of religion, and Da'wa among Muslims, and then shifted his focus outwardly through Islam to rebuild the world through interfaith cooperation, stewardship of the earth, and developing a moral leadership for the twenty-first century. In the name of Allah, the Merciful, the Compassionate "Give glad tidings to the patient ones, when they are visited by an affliction say, 'Surely we belong to Allah and to Him will we return' These will have blessings and mercy from their Lord, and these are the truly guided." (Qur'an) The Syrian Ministry of Waqf, The Supreme Council of Fatwa, The Muslim Scholars, Sheikhs and Clerics, The International Islamic Organizations, Councils and Foundations, The Sheikh Ahmad Kuftaro Foundation, The Kuftaro family members, With great regret and sorrow announce the passing away of: Sheikh Ahmad Kuftaro The Grand Mufti of Syria, the Head of the Supreme Council of Fatwa on Wednesday September 1st 2004, Rajab 17th 1425. We pray Allah, the Almighty, to have mercy on his soul and enter him the Gardens of Paradise. The funeral prayer will take place after the Zuhr prayers at 1.30 p.m. in the Omayad Mosque. The procession will move to the Misat square near the Syrian Ministry of Waqf, then to Abunour mosque (on foot). Condolences will be received at the Sheikh Ahmad Kuftaro Foundation, Abu Nour Mosque, Shamdeen Square, Damascus, 7.30-9.30 p.m., 2nd - 4th. September 2004. The Visitors' Entrance is the southern gate of the Foundation. H. E. SHEIKH AHMAD KUFTARO R.A.